Legislation introduced Sept. 12 in the U.S. House of Representative is calling to end taxes on precious metals coins and gold and silver bullion. H.R.6790, titled the Monetary Metals Tax Neutrality Act of 2018, would amend IRS code to clarify that gain or loss on the sale of certain coins or bullion is exempt from recognition. "My view, which is backed up by language in the U.S. Constitution, is that gold and silver coins are money and … are legal tender," said Congressman Alex Mooney (R-WV), the bill’s sponsor. "If they’re indeed U.S. money, it seems there should be no taxes on them at all. So, why are we taxing these coins as collectibles?" The Act states that "no gain or loss shall be recognized on the sale or exchange of (1) gold, silver, platinum, or palladium coins minted and issued by the Secretary at any time or (2), refined gold or silver bullion, coins, bars, rounds, or ingots which are valued primarily based on their metal content and not their form." 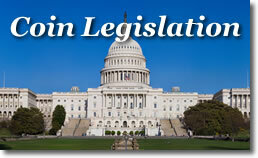 H.R.6790 has been referred to the House Committee on Ways and Means. It currently has one cosponsor, Rep. Raul Labrador (R-ID). For any bill to become law, it must pass in the House and Senate and get signed by the President. It’s about time someone woke up to the real, legal, constitutional freedoms and rights offered under the U. S. Constitution. In fact, it says that minting and distribution of gold and silver coins is the sole responsibility of the federal government. It says nothing about the printing of fiat federal currency! No monopoly money!